Here we have compiled a list of best iphone and ipad for biology and medical students. The HeRS (Hemorrhage Risk Stratification) calculator is an application that aids in determining the probability of hemorrhagic transformation of acute ischemic stroke in patients with an indication for anticoagulation. It is a prospectively validated score. Brainapse is an enthralling, engaging and an informative learning app, which helps in exploring the anatomy, structure and functions of the human skull and brain using AR, explains the evolution of the human brain and its working. Who could ever guess that brain despite its staggering complexities could still be such interesting organ to explore! A new educational app “Science – Microcosm 3D” will take you on a fascinating journey across the world of science. You will be able to see objects of the microcosm with your own eyes! Normally it is impossible to see them without a microscope. Finally, a colony manager arrives that makes breeding simple and integrated. The days of using excel spreadsheets, handwritten ledgers, or clunky software are numbered. Perfect for students, medical professionals, and anyone who needs synonyms and definitions on medical, cancer, bio-medical, or genetic terms. NeuroMind offers interactive clinical decision support and clinical classification and grading systems. The app is officially supported by Surgical Neurology International and the European Association of Neurosurgical Societies (EANS). Drosophila Assay Assistant presents a streamlined approach to recording and organizing time-based behavioral research data. It was designed as a scientific utility for fruit fly (Drosophila) experiments but can be easily adapted to various other research applications. The most probable number method is a common calculation in microbiology experiments, used in instances where positive results are easy to identify, but difficult to quantify. The MPN Calculator is a first of its kind mobile alternative that eliminates the need to fill out spreadsheet formulas and cells, or performing tedious calculations by hand until it produces a result within acceptable confidence limits. This app acts as a viewer for sequence, structure, and neutralization data for broadly neutralizing anti-HIV antibodies and the HIV-1 strains they recognize. It is meant to be a quick tool for scientists involved in HIV vaccine research. Lab Assist merges various digital laboratory aids into one app! Reference and Reporting for Invasive Plants and their biological control agents. This free application uses EDDMapS (www.eddmaps.org) to help county, state and federal agencies track releases and occurrences of biological control agents of noxious weeds. The Virtual Lab provides you a convenient overview of MilliporeSigma’s lab products and equipment for applications in the life science and industrial markets. Prepare a slide and adjust magnification on an oil immersion microscope to examine a Gram-stained sample and identify microbes hiding within. The Virtual Labs series of interactive science modules help train high school and college students in basic laboratory techniques. EverydayDNA is an educational mobile app that helps people learn about how our genes influence a variety of common traits and disorders. Users can also gain an understanding of how genes affect a person’s response to certain medicines. Relevant articles will be sent to users each week based on their areas of interest. The Molarity App from Sigma-Aldrich(R) is a chemistry calculator tool that generates lab-ready directions describing how to prepare an acid or base solution of a specified molarity or normality from a concentrated acid or base solution. A second tab includes a general molarity function that calculates the mass of any reagent needed to prepare a given volume of solution of desired molarity. A third tab features a stock dilution function that calculates how to dilute a stock solution of any known molarity to your desired volume and molarity. DataAnalysis is a general purpose iPad App for the plotting and fitting of all types of data that can be formulated as x, y pairs. The program can be used easily by both students and professionals. It is particularly useful for quick analyses of various types of data by curve fitting, value prediction via a standard curve, and analysis of kinetic data including enzyme kinetics. Explore a compound microscope, virtually! This mobile app lets you zoom around a 3D model of a compound microscope, learn about the different parts and explore photos and videos and read text demonstrating how its used. 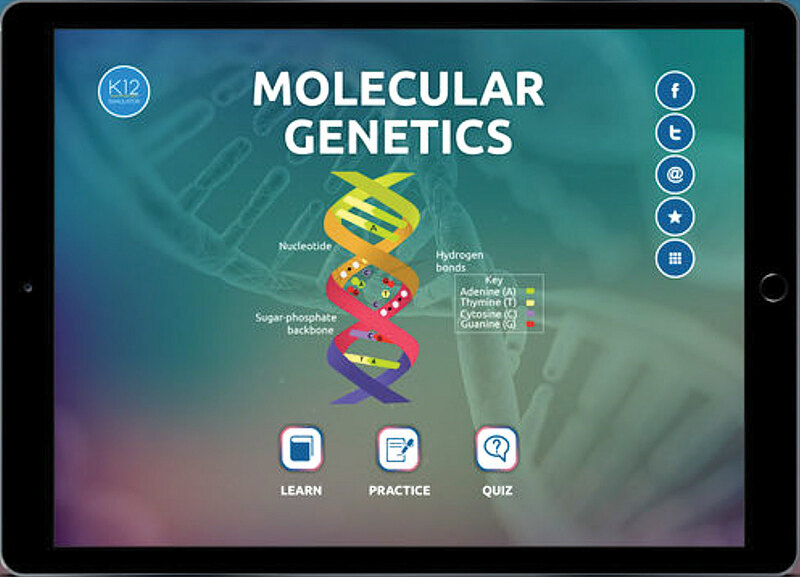 “Genetics and Molecular Biology” is an interactive app for students to learn about molecular genetics, molecular biology and genetics, genetics biology, bio genetics in an easy and engrossing way by visualizing the colorful images and videos. It is one of the best educational applications which is designed to help students learn molecular genetics, molecular biology and genetics, genetics biology, bio genetics in an innovative learning method. Sanger sequencing IOS application from Thermo Fisher Scientific. A handy tool for new or experienced users who perform automated DNA sequencing using Capillary Electrophoresis. This application’s main feature is a chemistry guide which covers all aspects of Sanger sequencing from the basic principles to workflows/ applications. A microscopic world is in need of your help. Take control of 16 cell membrane transporters to move molecules and ions into and out of cells. Over twenty unique puzzles will take you through the tough world of cell membrane transporters. Use channels, co-transporters, and antiporters to help the cell reach goal concentrations. Mendeley is a free reference manager and PDF reader designed for researchers, students, and knowledge workers. Make your own fully-searchable library in seconds, read and annotate your PDFs, and collaborate with others in private groups. Sync your library across all your devices including Mendeley Desktop, where you can easily cite your research as you write in Microsoft Word or LibreOffice. BioGene is an information tool for biological research. Use BioGene to learn about gene function. Enter a gene symbol or gene name, for example “CDK4” or “cyclin dependent kinase 4″ and BioGene will retrieve its gene function and references into its function (GeneRIF). NEBtools brings New England Biolabs’ most popular web tools to your iPhone and iPad, allowing you to plan your experiments from anywhere. Use Enzyme Finder to select a restriction enzyme by category, recognition sequence, overhang or name to find information on that enzyme.